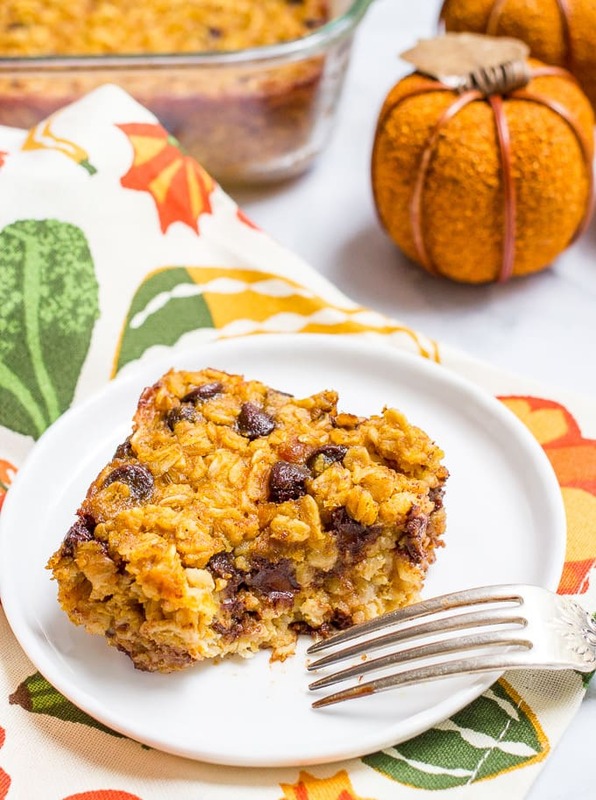 A fall breakfast favorite, this pumpkin baked oatmeal with chocolate chips is a fun and tasty way to start the day! Naturally gluten-free with a vegan option. Happy Friday, friends! I hope your week has been good and that you have something fun to look forward to this weekend! We had a mini scare this past week. A call from preschool, with J’s teacher saying he had a fall on the playground, busted his mouth and that it was B-A-D. Yikes. I rushed over to school and luckily, he had already started looking better. We went to the doctor just to be sure, but no stitches needed, no urgent care, just a little ice and rest and TLC. My sweet baby is a tough little boy! Good thing, cause I’m guessing that won’t be the last scare we have. As for the weekend, we may try to road trip to the zoo if the weather looks OK. We’ve also got dance class for M, I have a local blogger meet-up and I plan to put out ALL the pumpkin things since tomorrow is officially October. 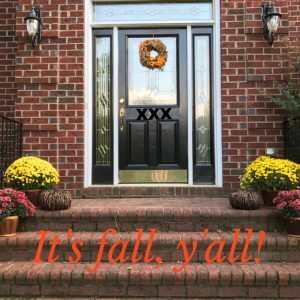 I’ve already gotten started a little bit with the fall decorating (see our front steps). Many, many pumpkins to be added soon. I can’t help myself! The kids are in on it, too. They picked out about a dozen mini pumpkins and gourds at Trader Joe’s earlier this week. I kept trying to say, “Stop, that’s enough,” but I was only half-hearted about it since I love them, too! M wants to keep some in her room, I always fill up a big bowl for our kitchen or dining room with them, I like scattering them on the mantle or the porch and on and on. So yes, I let them just keep picking. I’m sure we’ll get more, too! And now for the food! You guys know we love our oatmeal. 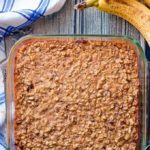 And while banana bread baked oatmeal is a year-round favorite, but I like to change it up with the seasons. Come fall, that of course means all things pumpkin! And I happen to think pumpkin goes especially well with chocolate. 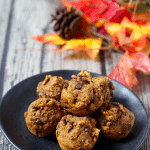 (See my pumpkin chocolate chip mini muffins and my peanut butter pumpkin muffins with optional, but recommended, chocolate chips.) 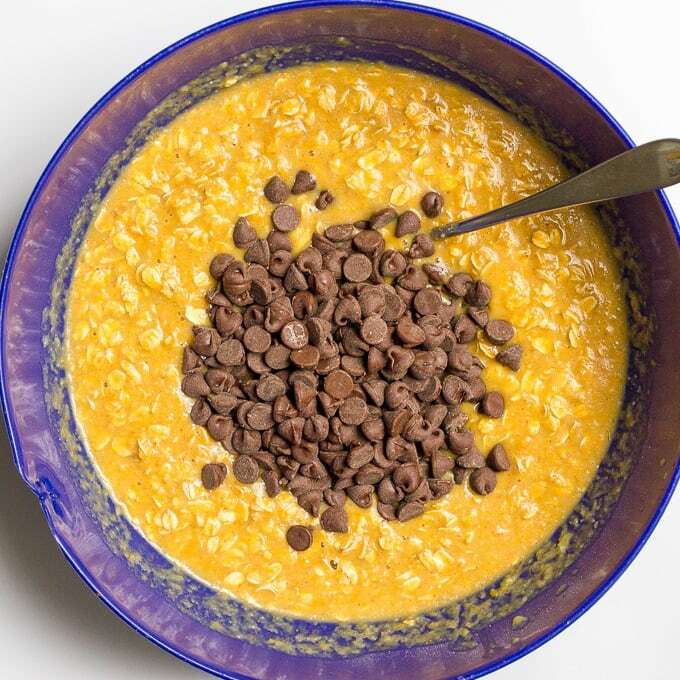 I have two more pumpkin + chocolate recipes coming your way too! You can sign up for my free weekly e-newsletter so you never miss a thing! It’s so decadent! Perfect for a weekend brunch, with leftovers to have during the week. 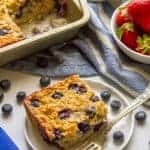 I love having lots of chocolate chips in every bite, but you could definitely cut back to 3/4 cup if you want to reduce the morning sugar rush. I’ve used honey here but you can sub maple syrup for a vegan option. 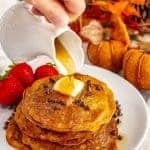 To make vegan, use maple syrup in place of honey, a flax egg in place of the egg, a vegan butter substitute or coconut oil and vegan chocolate chips. Serving a crowd? Just double the recipe and bake it in a 9×13 inch pan. You won’t be sorry if you have leftovers. You can keep leftovers in the refrigerator for up to 5 days, or freeze them for up to 3 months. Speaking of leftovers, I kinda love it cold, too. Same as with my banana bread baked oatmeal. But you can warm it up in the microwave in a flash if you prefer. 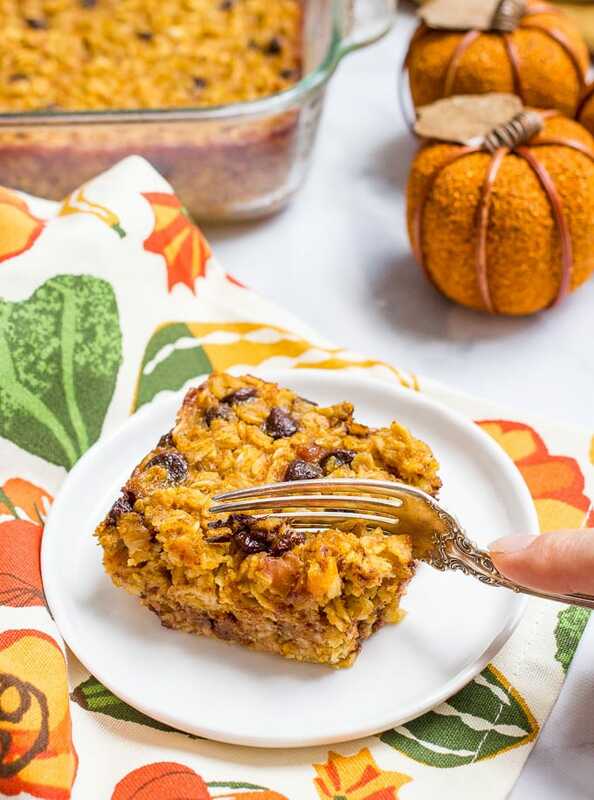 I hope you’ll embrace the fall season with this pumpkin baked oatmeal and indulge yourself with a little chocolate at breakfast! 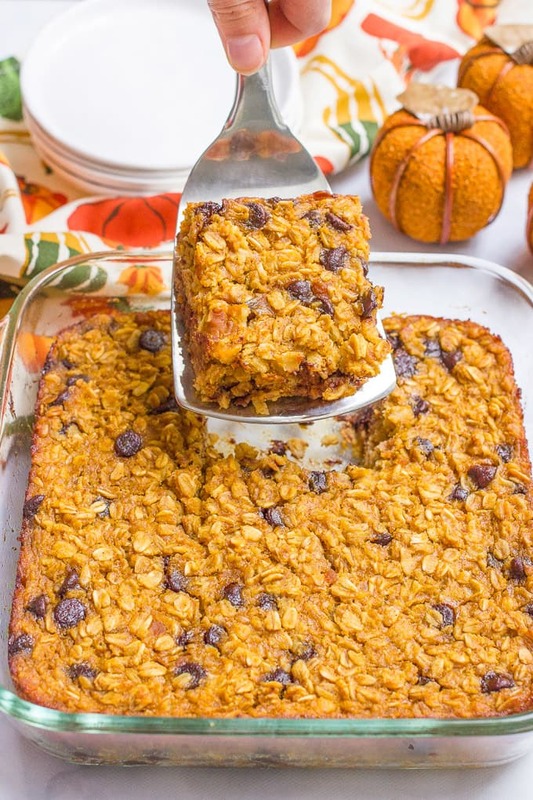 Pumpkin and chocolate chip baked oatmeal is a favorite fall breakfast! 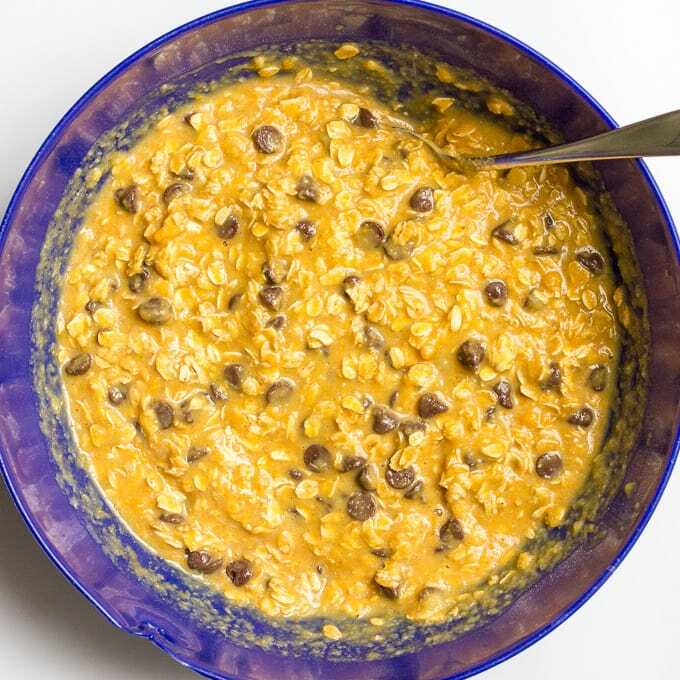 Add oats, baking powder, cinnamon and salt to a large mixing bowl and stir to combine. 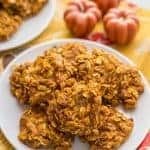 In a separate medium bowl, whisk together the pumpkin puree, egg, milk, applesauce, maple syrup, melted butter and vanilla. Add the liquid mixture to the bowl with the oat mixture and stir to combine. Bake at 375 for about 35-40 minutes, until set and cooked through. Let cool for at least 5 minutes in the pan before slicing and serving. 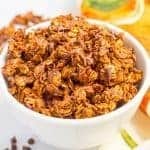 I love having lots of chocolate chips in every bite, but you could definitely cut back to 3/4 cup if you want to limit the morning chocolate consumption. Serving a crowd? Just double the recipe and bake it in a 9x13 inch pan. You won’t be sorry if you have leftovers. I’m glad everything is okay :O Poor little guy! O that sounds so good!!! Obsessed with everything oatmeal during the season! This sounds amazing!! Tomorrow is supposed to be rainy and I’m thinking this would be the ideal rainy Fall day breakfast. I never have applesauce though, so I may try it with a mashed banana instead. 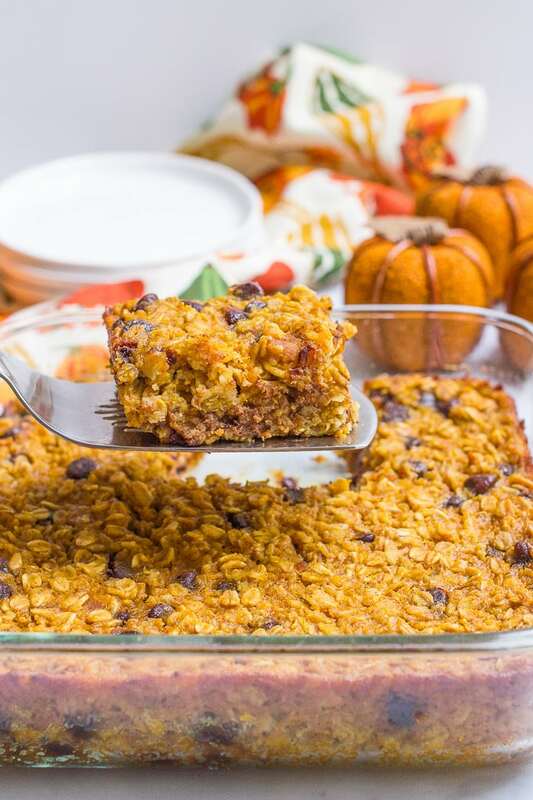 Thanks Kelli – it’s a great one for baking up on a rainy fall day! Would love to hear if you tried with the mashed banana! And yes, I can imagine the scare. I remember my parents would be so worried when something happened to me or my little brother… Luckily he’s alright! I love switching things up with our oatmeal too! Thanks Vivian! 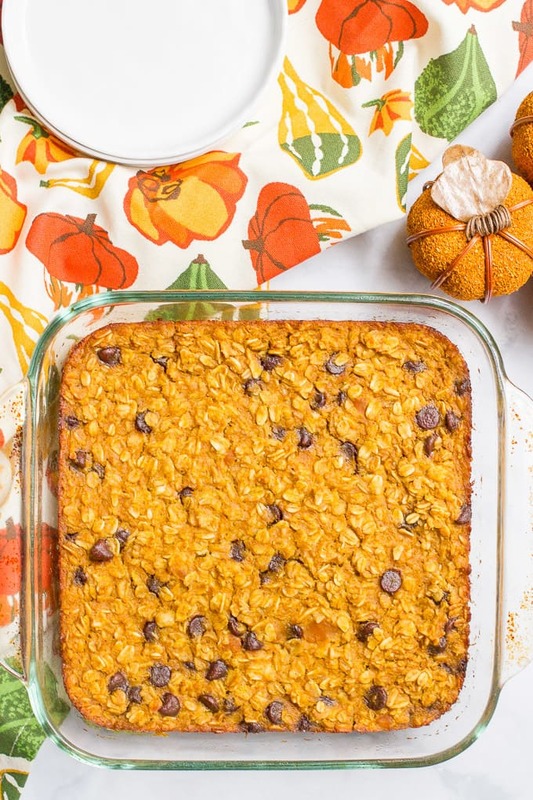 We LOVE baked oatmeal and I’ve been wanting to make a pumpkin version. Looks scrumptious! This recipe is so moist and tastes great. 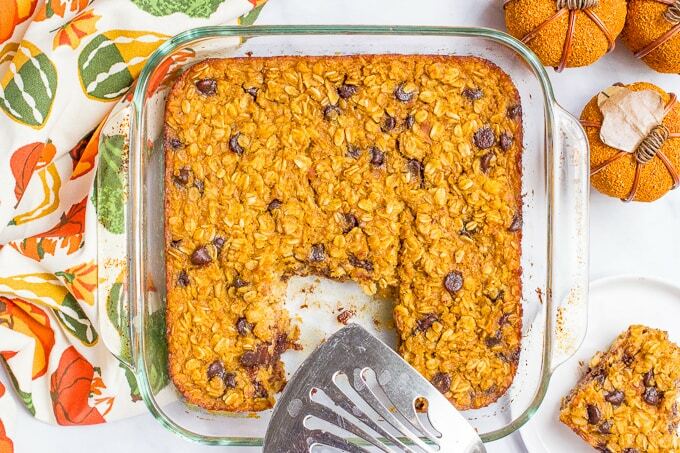 Baked oatmeal is my go-to in the mornings. I made a triple batch and used an 11×17 pan. This way I can cut it up, freeze, and grab one in the morning. Thanks for sharing the recipe! Yay, so happy to hear that Angela! 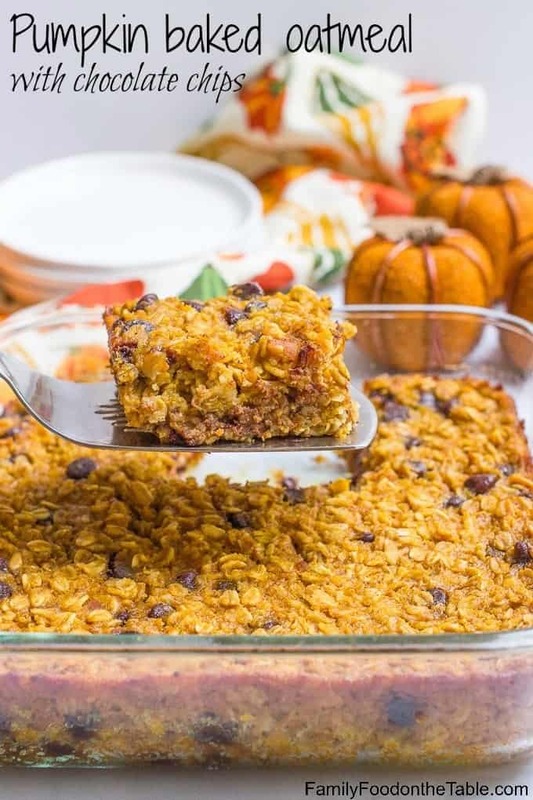 I LOVE baked oatmeal too – so easy to make ahead. Love that you do a triple batch – so great to have ready to go. Thanks for taking the time to comment – have a great weekend! I can’t seem to find the recipe for this! Would love to try. Where can I find it? Hi! I’m sorry, I’ve just switched recipe plugins and there seem to be some tech glitches. They are looking into it now. That recipe appears to be showing up at the very bottom of this post – underneath the big Pinterest image. (Hopefully will be moved back up soon once they figure out what’s wrong.) Hope you love it! Can I make this the day before, put it in the fridge (not cooked) and then bake in the morning? Hi Teri! The problem with that would be the oats would start to soak up the liquid and the leavening agents would start to activate, so having it sit overnight would affect the final baked oatmeal. Instead, I’d suggest either baking it all the way and rewarming it in the morning or baking it part of the way (maybe 25 minutes) and finishing it the next day. Hope that helps! This was scary good. It came out perfectly and I’ve been eating it with Greek yogurt. I will be making it again and again. Thank you for the recipe! My husband and I love these! The perfect treat to satisfy a sweet tooth without as much sugar as other options. They also are great warm or cold. We have made this twice now and will keep it as a family staple. Thank you! Yay, I’m so happy to hear you found a new favorite! Thanks for sharing Kate!